Unit 2 Gallery at London Guildhall University are delighted to exhibit the work of two former students, Julian Walker and Suky Best. Walker and Best were awarded the prestigious Owen Rowley Award for their final year work at LGU in the early nineties. Julian Walker's work centres on the nature of objects and sites, particularly in terms of what we project onto them. A large part of his work is about the sense of presence, particularly produced by traces of activity or space occupied, attaching to preserved sites and objects. This has led him to work with objects such as the Rosetta Stone, King Johns teeth at Worcester Museum, and Piltdown Man, using video, live art, photography, sculpture and installation. Walker is presenting collection-based works, looking at the slippage between object, curation and text, and will be showing video works from projects at Hastings and Wolverhampton. 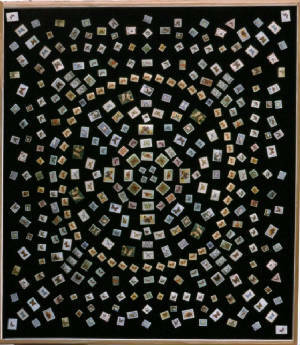 His work in this show uses such media as texts in Latin and the American Indian language Ashinaabeg, vast quantities of postage stamps portraying butterflies, and arrowheads made from feathers. Walker is currently working on an installation for the show Hygiene at the London School of Hygiene and Tropical Medicine, and on a solo show at the Berlin Museum of Medical History, for which he has recently been awarded a research grant by the Juliet Gomperts Trust. He was the first artist in residence at The Natural History Museum and was selected for the NewContemporaries, in 1999, showing at the Liverpool Biennial and Beaconsfield. In the past year he has exhibited in Hastings, Nottingham, Berlin and Iceland. He has also written essays for academic publications on subjects ranging from the flowers at Diana's funeral to why people want to touch Egyptian statues. Suky Best will show a selection from the series " The time for talking is over". This printed work focuses on small details of old postcards, re-presenting them in long strips, these narratives suggest and allude to events that may be about to take place. Each mini narrative elaborates on those moments playing on unpredictable events and unknown outcomes. These new episodes refer to the problems inherent in readings of surveillance footage. Best is greatly influenced by both photography and film, and the history of their different styles and techniques. The work looks at the various ways an image can be cut, interpreted and adapted. Best's use of montage, invests in the commonplace, the domestic and the mundane with an intensity and drama which invites the viewer to investigate and to impose individual interpretations on the imagery. Best is currently showing a new body of work in a solo exhibition at Danielle Arnaud, London. Prior to this she has had solo exhibitions at The Photographers Gallery London, The Centre of Photography Amsterdam, Turnpike Gallery Manchester, and The British Council Gallery in Ecuador. In 2001 she exhibited at East International, Norwich and Ex-machina at NGBK in Berlin & Cologne.